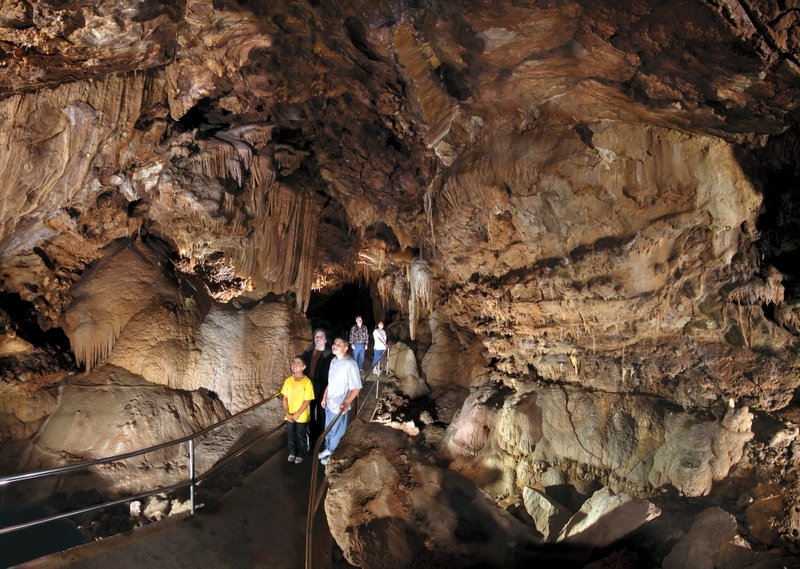 No trip to the region would be complete without a trip to the Lake Shasta Caverns Natural National Landmark. Open to the public since 1964, this natural attraction wows visitors from all over the world. Your adventure includes a catamaran boat ride across Shasta Lake, a scenic bus ride, and a tour of the caverns. Allow at least two hours for your visit. Tickets can be purchased online but you must get a boarding pass when you arrive at the gift shop. Tours are on a first-come-first-serve basis. Plan to arrive 30 minutes prior to your desired tour time. Allow at least 15 minutes to walk down to the boat. The boat will depart at the tour time and there are no exceptions. The tour begins with a scenic boat ride across the McCloud arm of Shasta Lake. It is a 10-minute ride across the lake. Once you arrive, you will load onto an air-conditioned bus which will bring you up to the entrance of the caverns. The ride offers the chance to see wildlife if you are lucky. Bald eagles, mountain lions, and black bears have been spotted from the bus. There are breathtaking scenic views of Shasta Lake and the guides are very knowledgeable. The ride will take about 10 minutes. The highlight of the trip is the 45 to 60 minute guided tour of the caverns. This is a very strenuous tour with over 600 steps. You have the option to just purchase a boat and bus ride. There is also a half-way point on the tour where you can leave and wait in the visitor center and watch a video of the caverns. There is plenty of time to see and photograph the caverns, and photography is allowed on the trip. Once the tour is completed, you repeat the process and return on the bus, then take the boat back across the lake. There is a nice gift shop with a snack bar with limited food items. The caverns are also pet-friendly but you will have to carry your dog while in the caverns. A shaded picnic area is available to enjoy after your tour. Lake Shasta Caverns National Natural Landmark is located about 17 miles north of Redding, CA, just off Interstate 5at exit 695.